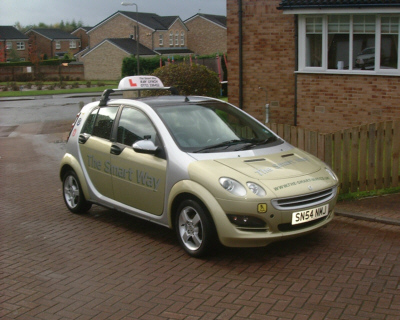 Here at The Smart Way we are pleased to announce that as of October 2008 we became one of the first driving schools in West Lothian to add an automatic car to our range. 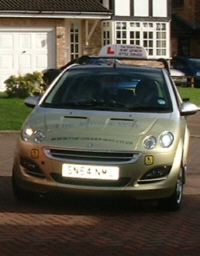 We remain one of only 3 driving schools with an automatic car in the area. Not so long ago, the price of an automatic car was considerably higher than the cost of a comparable manual, the gearboxes themselves were also physically bulky, this meant that the automatic option was often saved for the more expensive end of the market, often large cars - not generally suited to learner drivers. Modern technical improvements have made it practical for car makers to offer automatic gearbox options in much smaller cars today, with most manufacturers able to offer an automatic variant in their small car ranges. This, in turn, has led more and more learners to decide to take their lessons in automatic cars. Not having to worry about the gears means one less distraction when facing busy, difficult traffic. Clients with physical disabilities or specific learning difficulties who find the concept of clutch and gearbox too much or too daunting on top of dealing with the road. Modern automatics change gear at the best time for the car, regardless of what else is happening, thus keeping the car running efficiently, saving fuel (and money) and reducing carbon emissions. No jerky clutch movements means a smooth ride for your passengers. Why not join them? Contact us TODAY to get started on your lessons. The sooner you start, the sooner you TOO can pass. Is learning to drive an automatic easier? Will I be able to learn to drive quicker? Because learning to drive in an automatic car is generally regarded as a little easier, most people can expect to pass their driving test in an automatic car quite a bit sooner than they would in a manual one. However, you must be aware that if you take and pass a driving test using an automatic car (known as a category B1 license) you WILL NOT be legally entitled to drive a manual car without L plates and a supervising driver until you sit and pass the test again in a manual car. This may cause complications if you are hiring a car, for example on holiday or if you need to drive in an emergency. However, for some people taking lessons, and passing a driving test in an automatic car is a very effective way of getting on the road while they continue to practice in the manual car, taking more time to get used to the clutch and gears. What will the lessons entail? The driving test for automatic cars is the same as the test for manuals, therefore, at The Smart Way, our driving lessons in automatic cars will follow the exact same format as our driving lessons in manual cars. You will be taught according to our structured syllabus at a pace that suits you and will receive the same study aids as those learning in the manual cars. Lessons with start with learning about the controls and how they work, mastering basic control of the car. Then you will be introduced to basic road procedures, learning how to deal with hazards, progressing from the simple up to the more complicated. Finally you will learn to start to interpret what other road users are doing and discover how to deal with them safely. Remember, none of this part of driving changes because you are in a different car!! You will also learn all of the maneuvering exercises required to control the car in awkward situations. What about a Lady instructor in the Automatic, do you do that? YES! Our lady instructor, Mandy teaches in the automatic car, currently two days a week. If you are particularly wanting your lessons in the auto with Mandy, please remember to mention this when contacting us and we will be happy to try to accommodate. This sounds like what I am looking for... do you teach in my area? Our automatic cars are based in West Lothian, so our main areas are Livingston, Bathgate, Armadale, Linlithgow and East, West and Mid Calder. Due to the current demand for the car in West Lothian, we are not able to teach automatic in the Fife area. If you are looking for automatic driving lessons any your area is other locations close to those listed please give us a call. If we are already teaching near you then there is an excellent chance that we can accommodate you. Finally, to find out what our past and existing customers think of our service, click the Customer Reviews link in the banner to the left.